You Might Know Superman. But Do You Know These 10 Odd Family Members? With each passing era, the Superman family continues to grow with new characters. While we all know Supergirl, Jor-el, Krypto, Superboy, Power Girl And Bizarro, there are at least a few dozen other characters, both good and bad, that have assumed the role of Superman or become a member of the Superman family. Here we take a look at some of the forgotten heroes and villains. Born in the Phantom Zone, Christopher Kent (aka Chris Kent or Lor-Zod), who first appeared in Action Comics #844, is the son of Kryptonian criminals General Zod and Ursa and the foster son of Kal-El (Superman) and Lois Lane. He possesses the same powers as Superman and on Earth-16 he succeeds Clark Kent as Superman. Following the events of Action Comics Annual #11 or the Superman: Last Son arc, Lor-Zod sacrifices his freedom to ensure that General Zod is returned to the Phantom Zone. He later returns to earth as Nightwing. Bizarro Supergirl is as expected – a bizarre doppelganger version of Supergirl. Like Superman’s Bizarro opposite, Bizarro Supergirl (or Bizarro-Girl) is able to match Supergirl’s strength but most of her superpowers are the complete opposite. For example, instead of heat vision, Bizarrogirl’s eyes emit freezing beams of ice. She also has flame breath and speed as superpowers. On Bizarro World, almost nobody is born with the mental abilities of a normal human being. Zibarro, however, is. He is sensitive and intelligent, but sadly also powerless. While Bizarro is the complete opposite of Superman, Zibarro is the complete opposite of Bizarro. Although Zibarro closely resembles Superman, his suit has a “Z” on the chest. Superlad, from Earth-11, first appeared in Superman/Batman #24. Basically, he is Superman with blonde hair – that’s really the only difference between the two characters. Strange Visitor, aka Sharon Vance, who first appeared in Superman #149 – The Arrival of…Strange Visitor!, is essentially a female version of Superman when he had electromagnetic powers. A lightning strike on a plane causes Kismet and Sharon Vance to become Strange Visitor. She is connected to the Earth’s geomagnetic field and develops the power to manipulate electromagnetic energies. Joseph Meach, a former janitor at a museum, was struck by lightning and discovered that he had the combined powers of the Legion of Super-Heroes. Determined to defeat Superman and Batman, he became Composite Superman and used his shape-shifting abilities to form a costume that was half Superman and half Batman. Ramsey Murdoch, aka Saviour, has the ability to create physical objects from his imagination. He believes Superman is an impostor and the real Superman was killed by Doomsday. Murdoch suffers from hallucinations and believes that God wants him to punish deceivers. Cir-El, or Mia, is a human/Kryptonian hybrid first thought to be the daughter of Superman and Lois Lane. Later it is discovered that she was genetically altered by Brainiac to appear Kryptonian. She wears an outfit similar to Power Girl but assumed the mantle of Supergirl. Beppo is a monkey from the planet Krypton that was originally a test animal used by Jor-El to see if his son could survive space travel. Beppo turns up on Earth a few years after Clark and causes trouble with his abilities. Beppo went on to join the Legion of Super-Pets, alongside Krypto the Superdog and Streaky the Supercat. 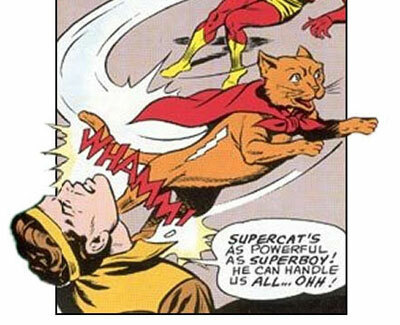 Supergirl’s pet cat Streaky was given super-powers by an unusual form of Kryptonite that Supergirl experimented with. The superhero cat went on to appear in many comic book stories during the ’60s.